My favourite thing is a good opening prologue that kicks off on a positive note only to end up establishing the conflict and context to the action right away. That juxtaposition between the world before the start of the game or movie and the resulting conflict or challenge that begins the main narrative. Done well, it's sublime. Basically, I like when there is a good narrative setup that immediately makes you think “this isn’t what I expected” or that shocks in other ways. Figment frames the narrative by greeting players with a quick audio scene of a father driving, focused too much on the child in the car instead of the road, which ends in a crash. It's abrupt but frames the world of Figment around the world of the father’s mind, the regrets he harbours, and the depression that comes from what he did. Figment is the latest title from Bedtime Digital Games, a developer well versed in games of a surreal nature. The studio's previous title, Back to Bed, tackled themes of narcolepsy under the backdrop of a M.C. Esher-inspired world. Figment carries similar symbolism and environment distortion to tackle another bold theme within the human mind. That said, the premise of the world in Figment might be closer to works such as Pixar's Inside Out when dealing with emotions of the mind. The relationship the protagonist, Dusty, has with his sidekick, Piper (a flying bird) feel like they were inspired by everything from Where the Wild Things Are through to Banjo and Kazooie. 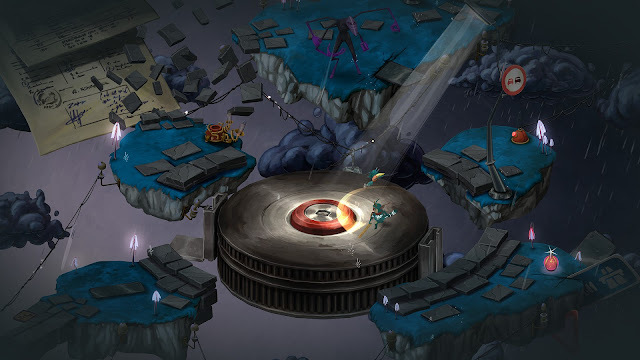 Despite its potential to go to some dark places, Figment tasks players with the goal of getting Dusty "motivated" and to earn his courage back, and while the highly abstract nature of the world and environments hold a degree of darkness, for the most part "whimsy" and "colour" are far more appropriate descriptors for what Figment is. The world Dusty finds himself navigating represents an abstraction of everything we know the brain to be. The right side of the brain is a creative countryside that contains musical instruments plucking out from the ground like plants. Vines and lush colours gives the lands to the right a Jack and the Beanstalk vibe. The world feels like it is out of a fairy tale, which is contrasted by the mechanical logical side of the left. A world built around clocks and puzzles, with a colder aesthetic design. 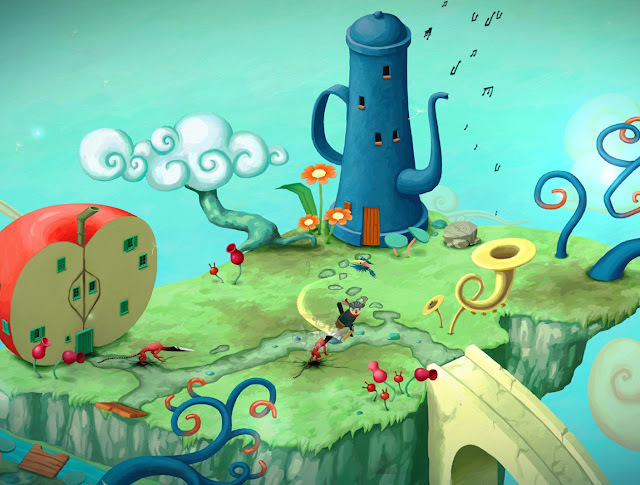 In general, the art direction of Figment works well to contrast the areas and work with the themes of the game. The clean colour palette helps helps ensure the game is bright and colourful without being gaudy, so as to underscore the themes the game tackles. 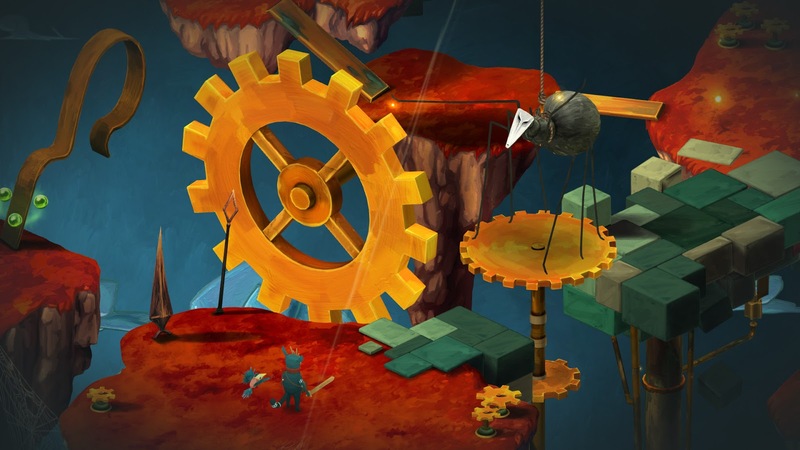 Figment isn’t looking to be a grim realistic portrayal of the human psyche, instead it balances the line of approachable for those affected by its themes due to the lightheartedness that the characters tackle those aspects with. Like the developer's previous title, Figment is riddled with more than enough puns, symbolism and cheerily-presented metaphors. This helps liven up the world and that's assisted by some brilliant voice acting. Banter often occurs between Dusty and Piper, with light hearted takes on the often more serious events playing out before them. Wandering into the homes of NPCs also often offers up amusing little quips, and helps to make exploring the world a genuine delight. The write-home-and-tell-everyone-about-it moment happens with the songs that the villainous nightmares pipe out. These tunes are like ear worm sea shanties with lyrics representing disease, depression and other fears, and they are memorable in their highly surreal design. If these songs were released on their own you would buy them, that's how well they stand on their own. The gameplay is built around exploration and completing puzzles to progress with battle mechanics at times to heighten tension. Dusty has a wooden sword which is used to battle physical manifestations of the fears the brain has. Combat is as simple as hitting a button with a charge for extra damage. Occasionally the weapon is used in puzzles such as hitting a deformed spin dial phone to rise stairs within the logic realm. Let's be honest here, if you're playing the game for the action you're there for the wrong reasons, but Figment does just enough to keep you on your toes throughout. Puzzles themselves are generally built around locating energy batteries which are located nearby. These are colourised to add extra complexity to the structure. 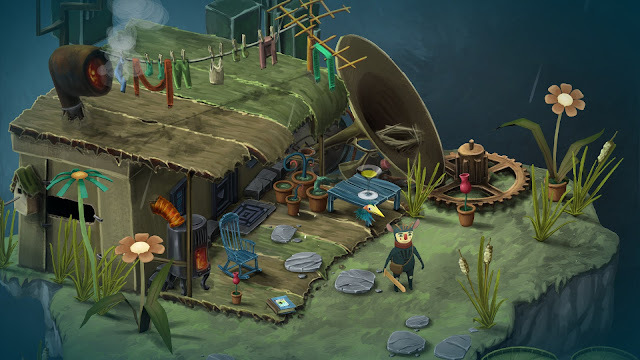 Besides these puzzles often the player is tasked with locating objects to progress areas. Again, they're not going to win awards for outstanding design, but they do enough to encourage you to explore the world, and that will lead you to find various memories that are used to tell the story of the characters and brain-universe. These memories show the aspirations of the character as well as fears, and he's a pretty good character. You'll get to like him a lot by the end. What players will find with Figment is a game that paces itself well to create a world that tackles the inner demons of its protagonist in a way that is simultaneously light hearted and without trivialising the seriousness of the themes. If for no other reason, you should look at this one for its art direction alone. It really is gorgeous.